Two surveys were conducted to gather public input: the first at the beginning of the design process to collect general information, and the second to get responses to draft concepts presented at Public Planning meeting #2 (held October 28, 2014). Please click *here* for a printable version of the draft concepts. Survey #1, conducted August 26 - October 28, 2014 (502 responses). Please Click *here* to see results. Map of Survey #1 response locations by street - please click *here* to view. Survey #2, conducted December 5, 2014 - January 18, 2015 (340 responses). Please click *here* to see results. Map of Survey #2 response locations by street - please click *here* to view. The City of Stamford and its consultant team, led by Stantec Consulting Services Inc., greatly benefited throughout the planning process from strong public participation, which generated foundation ideas and community support for future renovations of Cummings Park, West Beach & Cummings Marina. During the term of the planning process - June 2014 to April 2015 - the project team held three public planning meetings (6/17/14, 10/29/14 & 4/23/15) conducted 2 electronic surveys (10/23/14 with 437 responses & 1/16/15 with 292 responses), held three "meet the designer" sessions (7/15/14, 7/23/14 & 9/4/14), and made 2 presentations to the Stamford Harbor Management Commission (7/15/14 & 1/20/15) . 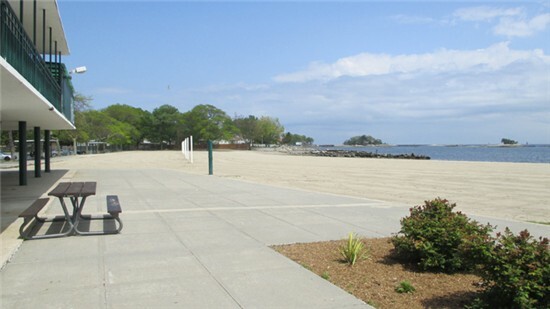 Main features of the redesign include a reduction of approximately 2.6 acres of pervious surface and enhancement of naturalized habit; increased access for pedestrians and bicyclists; upgrades to the pavilions and beach fronts in both parks; creation of a food truck area near the pavilion; consolidation of Fields 4 & 5 to create one, lighted, multi-use field; relocation of marina access to the east side to consolidate parking and allow more beneficial use of the west side parking lot; updating of the boat launch in West Beach and introduction of a transient dock in Cummings Park; updating of the permanent bathrooms scheme to create new restrooms to renovate existing facilities; and increased resiliency to sea level rise and increased storm intensity. Main features of the redesign include a reduction of approximately 2.6 acres of pervious surface (accomplished with parking reorganization and low-impact design practices; maintaining existing parking totals); enhancement of naturalized habitat by linking upland woodlands to the shoreline with a continuous buffer along the west edge of the park; increased and enhanced access for pedestrians and bicyclists from Shippan and Sound View Aves. ; upgrades to the pavilions and beach fronts in both parks to enhance the parks’ greatest assets; creation of a mobile food vendor area near the Cummings pavilion linked to the renovation of the pavilion and re-use of the second story level as an outdoor cafe; consolidation of Fields 4 & 5 to create one, lighted, multi-use field; relocation of marina access to the east side to consolidate parking, simplify traffic flow and allow more beneficial use of the west side parking lot as a significant recreation amenity; updating of the boat launch in West Beach to accommodate two boats simultaneously and refinement of the associated parking area; potential introduction of a transient dock in Cummings Park as a complementary use to the west end pavilion; renovation of existing bathrooms and addition of new restrooms at strategic locations (soccer fields, marina/fields 4&5, possibly at baseball fields); and increased resiliency to sea level rise and increased storm intensity (essentially integrated with design to avoid vulnerability). Take a look at the PowerPoint presentation. Gary Sorge, the lead designer from Stantec Consulting Services, lead the meeting and described the results of the outreach done to date (public planning meeting on June 17th, project survey conducted August-October, interviews with stakeholders & City staff), described the major topics brought forth by the outreach, and presented some preliminary sketches of the main elements. Take a look at the PowerPoint presentation. This meeting was dedicated to getting information from the public. Stantec came up with some ideas while studying the park, some of which they showed in their PowerPoint presentation, although they had not done any formal design work up to this point. After the presentation, the attendees broke up into groups to discuss what they felt were the strengths, weaknesses, opportunities, and threats in the parks and the marina. Please click here to view a summary of the input provided at the meeting. There were three "meet with the designer" session dates offered during summer 2014. The Senior Principal from Stantec Consulting Services Inc., Gary Sorge, made himself available to speak to individuals or small groups of stakeholders to get input, explore possibilities, and answer questions. These small sessions were offered to facilitate detailed, focused discussion not possible during the public planning meetings. Thank you very much to all who participated. The Stamford Harbor Management Commission regulates and monitors water front development, and encourages the retention of water front industries and recreational uses in all parts of the Stamford Harbor Management Area. Gary Sorge, of Stantec Consulting Services, made a joint presentation with Roberge Associates Coastal Engineers (RACE) on the master plan for the parks and marina, with a focus on review of the draft plans for the reconstruction of the marina and the beach resiliency planning study.